BY FEBRUARY 1853, SILVER COINS (other than 3 cent pieces) could not be had in the United States. As soon as the small quantities of no-arrows coins left the Mint, bullion speculators bought them up from the local banks and promptly melted them for export as silver bars, at a figure well above face value. Congress finally (February 21) passed an act reducing the standard weight of each silver coin from the half dime through the half dollar inclusively to a new weight which would make remelting useless. Silver dollars and trimes were ignored, the former for unknown reasons (sentiment? )—so that the tiny coinages vanished at once, the 3 cent as they were already worth less as bullion than their face value. On March 3 Congress passed a supplemental "Deficiency" Act aimed at plugging loopholes left open by the law just named. Among other provisions, trimes were brought into line with other subsidiary silver coins. From now on they were to be struck in standard silver (0.900 fine) at 11.52 grains apiece. The new design was to be discretionary with the Treasury; Longacre suggested the simplest possible modification, which Mint Director Eckert approved. This was to raise the rim of the star and to add two extra outer rims, making three in all; on reverse, a bunch of arrows and an olive branch were added above and below III. In the J.J. Mickley collection, auctioned 1867, was a Proof of the new design dated 1853; this has not since been located, though at the 1952 ANA Convention in New York rumors circulated that it had been seen. The Type Two coins for some reason are usually weaker than earlier or later trimes. 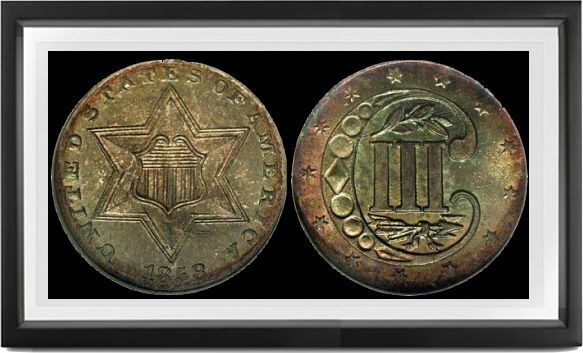 In Mint State they are very much rarer, for the same reason as 1853-55 arrows coins: they went at once into circulation and stayed there. Quantities struck were surprisingly limited, possibly as there were still plenty of Type One coins around, especially going into and out of post offices. The majority of the coins dated 1854 are from an obverse die with part of an extra 5 between the bases of 85. There are a dozen or fifteen Proofs from the perfect die; later, this die was used on production coins until it shattered. The other three varieties are all rarer: normal date (no trace of extra 5) with star point almost touching 5; normal date, lower, very heavy; normal date, lower, thin and shallow. The date 1855 has become very famous as a "key" date because of its low mintage for the design. Only three pairs of dies were made for it, only two being traced to date. The more often seen one, with date first logotyped higher (slanting down to right) then corrected, parts of extra 5's within 55, was used to make possibly as many as 20 Proofs plus over 95% of the 139,000 business strikes; the other, very rare, has normal date and quadruple outlines to star. The 1856 is undervalued, well struck examples being rare, really Mint State ones nearly as rare as those of 1854-55. The same comment holds for 1857 and 1858. About 25 pairs of dies were made for the 1856 mintage; the number of dies for 1857 and 1858 are not recorded but are likely to have been nearly equal to 1856 or a little less. Many examples of all these dates show field striations, shallow raised parallel lines; these apparently originate from the lapstone used to impart polish to the dies even of production coins. There are at most a couple of dozen Proofs of 1856, about the same number dated 1857, and perhaps 60 to 75 Proofs made of 1858, of which a few dozen survive, most of them poorly cleaned.